Ceragem held the 8th Sharing Kimchi for Winter event using the cabbage it grew. Ceragem, the global health care specialist, held the 8th Sharing Kimchi for Winter event using cabbage it grew on the 30th. 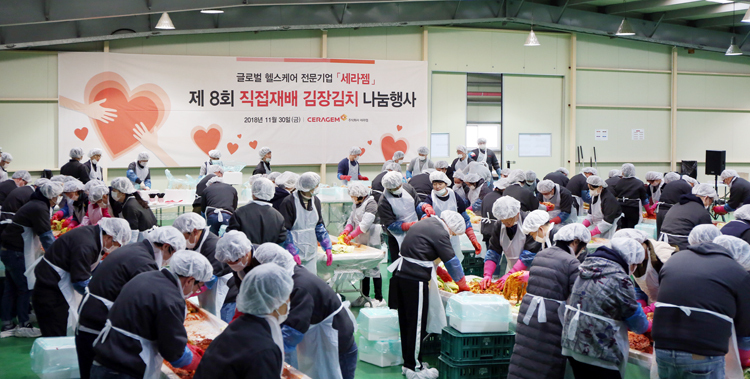 About 200 officers and employees of Ceragem and volunteers from the Asan Multi-Cultural Family Center joined the Sharing Kimchi for Winter event, which was held at the head office of Ceragem in Cheonan. 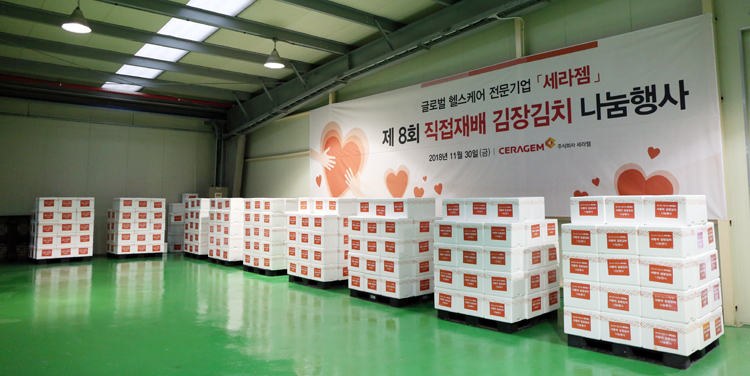 Ceragem made 4,500kg kimchi that day and delivered it to low-income families, basic livelihood security recipients, senior citizens living alone, and multi-cultural families in Cheonan and Asan. The Sharing Kimchi for Winter event is Ceragem`s representative social contribution activityand has been done every year since 2011. Sharing Kimchi is more meaningful because the cabbage was grown by officers and employees of Ceragem from September in the vegetable garden at the company. Ceragem has been supporting the Child Fund Korea and the Korea Scoliosis Foundation on a regular basis, implementing social contribution activities including the `Ceragem Hope Sharing Volunteers Group` regularly doing volunteering service in social welfare centers. As the global enterprise in about 70 countries in the world, Ceragem has been engaged in a wide range of CSR(Corporate Social Responsibility) activities abroad as well as in Korea, including the construction of the Small Hope School in China, the Dream School Project in India, and the University Scholarship in Indonesia.